Put a cork in it…if you are a traditionalist, then this might be your mantra when it comes to that bottle of wine you are about to purchase. Lately there has been a lot of discussion about what might be the best stopper for wine bottles: cork, screwcap, glass, synthetic? I thought it might be worth taking a look at cork (we’ll look at the other stoppers next week) and see what it is and why it’s used. In the 1600s, the blind French monk, Dom Pérignon, took the first steps towards the use of cork as a wine closure. Containers holding sparkling wine (the glass bottle had not been developed yet, which could hold sparkling wine) traditionally had been plugged by wooden stoppers wrapped in olive oil-soaked hemp. Dom Pérignon observed that these stoppers often popped out. He successfully swapped the wooden plugs for cork stoppers and cork soon became essential for wine bottling. Cork is actually the bark of the Cork Oak tree. These trees grow mainly in Southwest Europe (Portugal and Spain account for over 80% of cork production). 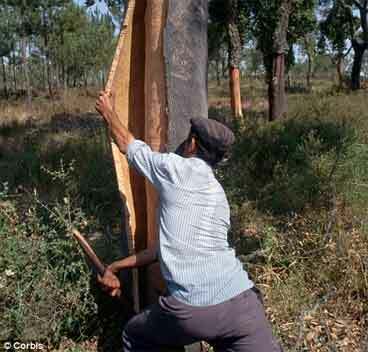 Every ten years, the bark is stripped from mature cork trees (at least 25 years old). This process does not harm the trees, which can live over 200 years. The harvesting of cork takes place during May to August, when the cork separates easily, without causing damage to the tree. The workers specialized for this job use a very sharp axe-like tool, that they use to make some cuts: one horizontal around the tree, called a crown, and two or three vertical cuts, called rulers. This is the most delicate phase of the work because, despite using a lot of force to cut the cork, it must not cut into the underlying “mother bark”, whose disturbance could lead to the death of the tree. Following the harvest, the bark is seasoned and sorted. Seasoning allows the cork to stabilize and develop a uniform level of moisture. After seasoning, the cork is boiled to remove organic solids stuck in the pores and to bring it to the correct moisture content for processing. This maximizes the cork's thickness, compressibility and elasticity. The cork is then punched, dried, polished and a thin film of paraffin wax or silicone is applied to each cork, to make it easier to insert into and extract from the wine bottle. Lastly, the corks are packed in plastic bags, with sulfur dioxide gas and shipped to wineries around the world. Because of the cellular structure of cork, it is easily compressed when inserted into a bottle and will expand to form a tight seal. The interior diameter of the neck of glass bottles tends to be inconsistent, making the cork’s expansion and contraction an important feature. 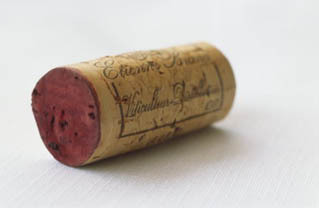 Natural cork stoppers are important because they allow oxygen to interact with wine for proper aging, and are best suited for red wines purchased with the intent to age. However, natural flaws and cracks in the cork bark make its’ sealing ability a bit inconsistent. This would cause the wine to age too fast, even to the point of being oxidized. The biggest complaint about cork is “cork taint” or “corked wine” What this refers to is a wine fault. There is a noticeable odor that is often described as “moldy newspaper”, “wet dog”…or to me “chlorine”. This is a chemical reaction caused by 2,4,6-trichloroanisole (TCA). However, in recent years major cork producers have developed methods that remove most TCA from natural wine corks. It’s now thought that TCA may actually occur in the barreling process. When you are in a restaurant, and the Sommelier hands you the cork, what are you suppose to do? Don’t bother smelling the cork, it won’t tell you anything. But do look at it. You can tell several things from a cork. Many are marked with the place the cork was made, as well as the winery the wine came from. The narrower and more misshapen the cork, the longer the cork has been in the bottle. You should also look at the “mirror” (the portion of the cork that has been in contact with the wine). Sometimes you will see small crystals - this is not broken glass, but merely tartrates (or “wine diamonds”), a harmless substance sometimes found in wine that hasn’t been cold stabilized. Also, if the wine has stained up the side of the cork, this may be an indication that the cork has failed, and the wine might be oxidized. Next week, we’ll take a look at some of the other wine stoppers, and let you determine which you prefer. In honor of "American Craft Beer Week", I thought it might be nice to change things up a bit, and do a brief discussion on beer (I know my beer making, and drinking, friends will appreciate that). Beer's history precedes that of wine, and probably was discovered by accident, when some cooked grains that an early nomadic hunter-gatherer carried, came into contact with water, and fermented. Mesopotamia is thought to be the origin of brewing, when the Sumerians produced bread from barley, and dipped it in water to ferment...basically "liquid bread". There is even some thought that the words "bread" and "brew" were once the same word. Beer is made from a simple list of ingredients: water, grain, hops and yeast. The water portion is pretty self explanatory, but many will argue that the mineral content will affect the final outcome. So the water source is often emphasized, but in reality, with today's chemistry, water can be treated to create the desired mix. Where things get interesting is the type of grain used. The most common are: barley, wheat, oats, corn, rice and rye. Barley, wheat, oat and rye are "malted", a process which stimulates germination in the grain, and converts the starch to sugar (which is needed for fermentation). 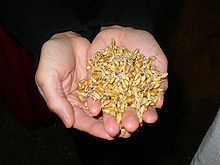 This "green malt" is then dried to create the malt we're familiar with. This is then ground down into "grist" and mixed with water to help dissolve the sugars. Each of these grains imparts different flavors on the finished product. Barley is soft, sweet and clean. Wheat is slightly tart. Rye is spicy. Oats are oily and silky. Rice and corn are light. 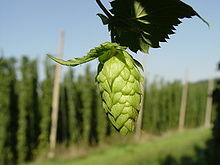 Hops is a flower, or more precisely a cone, from a plant that is related to hemp/marijuana. Hops was probably first used as an aroma agent to replace a variety of flowers and herbs, and found superior to those when its' preservative power was uncovered . Today it continues to be used to add aroma and bitterness (to balance the sweetness of malt). There are literally hundreds of varieties, and they vary just as much as grape varieties do, and are affected by the soil and growing conditions...just like grapes. Lastly is the yeast. While this may seem like a minimal part of the beer, it will in fact affect the final product. There are three types of beer: Lager, Ale, and Lambic. Each of these is determined by the type of yeast used. Lagers use a yeast that ferments at lower temperatures. These yeast move to the bottom of the fermentation tank, and ferment from the bottom. Lagers are cleaner, rounder, less fruity, and drier than ales. Ales, on the other hand, ferment at warmer temperatures, and ferment from the top of the tank. Ales leave behind complex esters and sugars. Lambics are wild yeast beers, and are only produced in Belgium (in the Zenne Valley). Today, it is common to see additional ingredients like fruit, coffee and chocolate. Just like wine, beer has classic food pairings too: Guinness Stout with Oysters; English Ale with Cheddar or Stilton Cheese; German Lagers with Bratwurst; and Belgian Gueuze (a lambic) with mussels. I'd also dare to say my Bacon Jam from last weeks' blog would work well with Stout. So what are your favorite beers, and beer pairings? I'm sure my friends from the local home brewers club will chime in. Those of you who have been following this blog for the past six months know that I usually write my blogs late on Tuesday nights. Well last Tuesday, the blog service I use was down, then again on Wednesday, and Thursday I was completely distracted. Distracted...you say? Yes, I was obsessed with the smells wafting through my house. You see, I had been hearing about “bacon jam” and decided to find a recipe and make some myself. 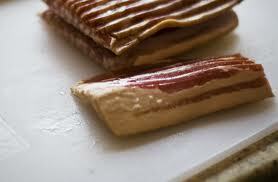 I can’t think of anything better than bacon, onions, garlic, maple syrup and coffee, as something spreadable and edible. 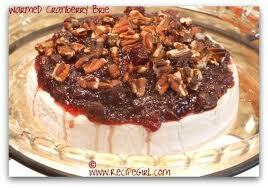 Soften Brie with Caramel Nut Sauce – this is my own creation, so if you want my recipe, e-mail me. Back to that “bacon jam”…here’s what I’m thinking: start with a sliced baguette, add a little spread of bacon jam, some butter lettuce and half of a cherry tomato. This will basically be a “BLT appetizer”. I’m thinking this should go well with a number of wines, but in particular Zinfandel. This Friday, my wine club is tasting some French wines, and we have a Provence Red, that I’m looking forward to pairing. I’ll let you know how it goes. In the meantime, do you have some favorite appetizers to pair with your wine? Share them here, by adding your comments. If you have a link to the recipe, feel free to add it. It's almost Cinco de Mayo, that time of year when everyone grabs some Mexican food and a Margarita (or two, or three). Have you ever given thought to what's in your glass? According to the International Bartenders Association, the officially accepted ingredients and proportions, for a traditional Margarita are 50% Tequila, 29% Triple Sec (an orange-flavored liqueur), and 21% fresh lime juice. In the United States, the thick skinned Persian limes are usually used, while the original Mexican margaritas use key limes. Key limes are smaller, and have a strong, somewhat bitter, citrus flavor. Many times, the triple sec is substituted with other orange-flavored liqueurs like Cointreau, Grand Marnier, Patrón Citrónge or Gran Gala. All three ingredients are shaken with ice or served on the rocks, or in the US, commonly blended with crushed ice, in the form of an alcoholic "slushy". Let's focus on the Tequila component...what is it, and how is it made? Tequila is a spirit. It all starts with the Agave plant (related to the Yucca). More specifically Tequila is made from the Blue Agave plant, and can only be made in the province of Jalisco, in Mexico. The Blue Agave plant grows best at high altitude, and develops the necessary sugar after growing for eight to fifteen years. At harvest, the "pina" or the heart of the plant is baked or steamed to soften the fibers, allowing the juice to be released. Traditional "juicing" of the pina is actually a crushing process achieved by grinding the cooked plant fibers under a large stone wheel, pulled by a donkey. Obviously, this process has been modernized over the years, but small production Tequilarias still use this process. The juice is then allowed to ferment (nowadays, cultured yeasts are added to control this process). The resulting alcohol is known as "pulque". The pulque is next distilled at least two times, to create a clear spirit. It then can be barrel aged, blended, or bottled. There are four official styles of Tequila: 1) "Plata" (also known as "Blanco" or "Joven") - these are young, usually aged no more than 60 days, they are clear (some time charcoal filtered; 2) "Joven Abocado" (also known as "gold", or "oro") - these are young spirits that have caramel added for color and flavor; 3) "Reposado" - these are oak aged for a minimum of two months; and 4) "Anejo" - these are aged at least one year in oak. These four styles range from harsh and pungent to smooth and complex, in the order presented. Lastly, by law, 51% of the alcohol in a Tequila must come from the Blue Agave. The rest might come from added sugar. These Tequilas are known as "mixto". The finest Tequilas are made from 100% Blue Agave, and will be labeled so, on the bottle. Raicilla - the local "moonshine"
So what is the difference between Tequila and Mezcal? All Tequila is Mezcal, but not all Mezcal is Tequila. Huh? Mezcal is a generic term for spirits made from any type of Agave (remember Tequila is only made with Blue Agave), and Mezcal can be made anywhere in Mexico (but mainly in Oaxaca). One other key difference is the cooking process of the pina...Mezcal is commonly cooked in underground smoke pits, which give Mezcal a more pungent, smoky flavor. Now we are seeing flavored Tequilas. On my last trip (obviously my "bearded days, if you look at the photos) to the Agave fields of Jalisco, I tried coffee flavored Tequila, and probably the most unique, Domiana Tequila. Our host insisted that Domiana is a relaxant, and he took a shot every night before going to bed. I must admit, this is some good stuff. It is more of an after dinner sipping drink, or almost like a liqueur. The Mayans used Damiana as an aphrodisiac. If you can find it, give it a try. If you add it to your next Margarita, you never know what might happen!